Given how many different gadgets we all use, dealing with the rats nest of cables and chargers around your desk could be well worth the £40 price tag on the IDAPT i4.This sleek slab of a charger claims to charge four devices at once (phones, PDAs, GPS devices, MP3 players, digital cameras, iPads, handheld gaming devices and the like rather than notebooks), and to do away with cables. Given how many different gadgets we all use, dealing with the rats nest of cables and chargers around your desk could be well worth the £40 price tag on the IDAPT i4. This sleek slab of a charger claims to charge four devices at once (phones, PDAs, GPS devices, MP3 players, digital cameras, iPads, handheld gaming devices and the like rather than notebooks), and to do away with cables. For the first three devices you want to charge, you snap one of the six supplied adapters (micro USB, mini USB, iPhone/iPod, Nokia, Sony Ericsson and Samsung) or another tip from IDAPT into one of the three holes in the i4 and attach the device directly. If you want to charge four at the same time you'll need one cable as the fourth device attached via a USB port on this side. That's also useful for devices that IDAPT doesn't have a tip for (none of the four Samsung tips offered seemed to fit the elderly YU-T9 MP3 player I use to record interviews although it's hard to be sure because you can't search the Web site by device and the list of compatible devices is presented in a small scrolling box in small grey text that's not searchable). It's also useful because not all devices sit happily side by side on the i4. if you have a BlackBerry Bold and a Palm Pixi - both of which have the power port on the side rather than the base - you have to make sure one of them is in the single front socket rather than putting them side by side. Swapping the different adapters is easy; press the two buttons on either side of the slot and the adapter that's in there pops out. The slot is keyed so you can't put the adapter in the wrong way round (which would reverse the polarity on the current and could damage a device); but the plastic lugs that match the slot shape are tiny, fragile and bend if you accidentally put it in the wrong way round. Plug in a tip and the LED in front of the slot goes green; attach a device and it goes red while it charges. Annoyingly, it stays red when the device is charged; having it turn amber or green would make it much easier to spot when you can turn the IDAPT off. EDIT: IDAPT tells us that despite the manual saying the LED stays red, when a device is fully charged the light should go green again ; we didn't see this happen even when devices showed a full charge, until we plugged our first Windows Phone 7 device into it. You can tidy up the cables for multiple devices and chargers with a variety of cable organisers or homemade alternatives like these clips but the IDAPT is neater - your gadgets are held in place and the cables don't slide onto the floor - and it means there's only one thing to plug in and switch off (and only one power outlet in use). Like the adaptors, the power switch feels a little flimsy (it's a piece of the base partly cut away to act as a rocker switch) but you'll definitely want to use it. One of the selling points for chargers that handle multiple devices is saving electricity and if you plug in several devices you might save a little power over using individual chargers, mainly because stepping down the volts and amps to the appropriate level once (and throwing away the rest as heat) is more efficient than doing that three or four times. Devices don't charge noticeably more slowly than on dedicated chargers and the i4 does use a little less power. 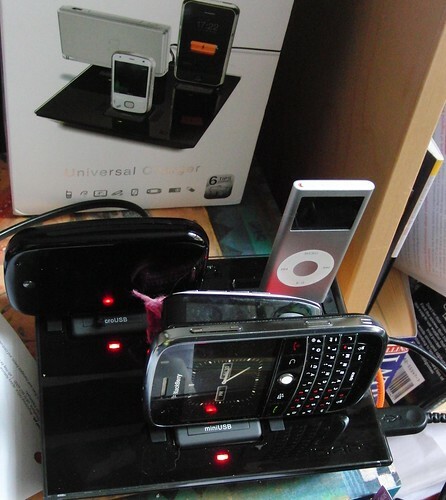 With four devices plugged in to charge it used between 9W and 11W; that goes down to 4W for two or three devices (or one device connected via USB). Individual chargers for a smartphone like a BlackBerry, Palm or HTC phone use between 4 and 7W (so 20-odd W for four devices). If you tend to leave devices connected once they're charged that still uses power (2W for individual chargers, 4W for the i4) - and unless you turn the switch off the i4 will use 2W to light up the LEDs even with no devices plugged in.